Four water features are located throughout K1 Investment’s newly renovated office building in Manhattan Beach, CA. Strategically placed across multiple floors, the water features add a natural element to the modern space. Located on the first floor, a 9 ft. wide Water Veil stands along the edge of the north balcony. Water cascades down the mesh screen, adding a soothing ambiance to the modern patio. On the south balcony, another Water Veil was placed directly behind a fire feature. Decorated with wave-like stainless steel embellishments, the 12 ft. wide Water Veil is the focal point of the opposing outdoor space. The illuminated water patterns and sounds of flowing water create a relaxing and tranquil atmosphere for employees and visitors to enjoy. One of the two features located on the second floor, consists of a copper podium rivulet placed directly in front of a 24. ft. wide Water Veil. Streams of water fall from the custom rivulets on the copper podium, creating peaceful sounds of trickling water. The variations of water textures and materials create a compelling composition for the space. On the opposing side of the second floor, two stainless steel podiums are nested in a basin of river rocks on the north balcony, visible from the main conference room. Water bubbles out of five nozzles, overflowing the pool atop the podiums and gliding down the two mirror-polished podiums. A granite water wall adds a soothing element to the newly renovated lobby located in a prominent commercial office building in the heart of Beverly Hills. Carefully arranged columns of smooth and textured black granite create water patterns as continuous waves of water gently fall 14 feet from the ceiling and disappear into a stainless steel basin clad in Italian marble. Two contrasting, yet correlative water features are the focal points of the entry way and a secluded outside patio in a contemporary home in Malibu, CA. A Bernar Venet sculpture appears to levitate atop an infinity pool on the secluded patio outside the Malibu home. Standing in a courtyard surrounded by glass windows, the feature is the focal point of the outside patio, and can be seen from any point inside the house. Underwater lighting illuminates the sculpture, creating interesting reflections along the surface of the still pool as it seamlessly disappears along an infinity edge into a hidden pool below. The pool is level with the ground below, creating the visual effect of water extending infinitely or vanishing along the ground plane. Three stainless steel sculptures stand at the entry way of the modern home. Strategically designed to mimic the curvature of the house, the sculptures compliment the surrounding architecture, yet add a unique, captivating element to the outside patio. Cascading water creates vibrant reflections off the stainless steel surfaces, reflecting the existing greenery surrounding the sculptures as well as the illuminated pond below. A sculptural copper water wall with bronze patina stands opposite the front door in a contemporary home in the hills of Pacific Palisades, CA. Based on a deconstructed wave, the sculpture works symbiotically with the existing landscape, creating an inviting and soothing ambiance to the entryway courtyard. The collection of curved and flat surfaces with variations in textures, are strategically constructed to compliment the movement of the falling water. Underwater lighting illuminates the patterns that glide along the surfaces of the sculpture, drawing attention to the feature even from inside the home. Standing 10 ft tall in a beautiful Beverly Hills backyard, our rain curtain wall invokes a sense of melody & calmness as water travels up the cantilevered stainless steel frame and emits 500 rain droplets trickle into an infinity edge pool. LED lights change different colors, illuminating the feature & transforming the backyard into a colorful oasis. Located in an outdoor plaza, the Santa Fe Trail Reflections water sculpture stands as a nationally recognized, permanent outdoor public art installation in the City of El Monte, California. From above, the water feature depicts a proportionally accurate map of the city, portraying its exact location with the placement of a polished sphere on the reflecting black granite pool. A rectangular brass basin surrounds the water feature, with incised lettering and a compass rose, pointing out prominent water ways within and around the city, including the San Gabriel River and Rio Hondo. Water seamlessly falls along the edge of the copper structure, creating interesting reflections from the surrounding environment. Illuminated by underwater lighting, the installation acts as focal point, sitting in the center of pedestrian plaza. Three mesmerizing Water Veils accent a courtyard in a contemporary private residence in The Vintage Club, located in Indian Wells, CA. Standing 14 ft. tall, the frameless Water Veils fall from a slot in the ceiling into a courtyard pond, seamlessly clinging to the surface without a splash. Water effortlessly cascades down the stainless steel mesh screens, creating captivating waves that add a soothing ambiance to the modern courtyard. Translucent and clean, the veils compliment the geometric landscape and clean lines of the house. Situated in the newly rebuilt St. John Vianney Church in Hacienda Heights, CA, this cross-shaped baptismal font represents modern design and functionality. The contemporary font contains a smooth, tranquil water surface that reflects the beautiful surrounding walls and vaulted ceiling. Along the edges of the feature are subtle water walls that provide quiet streams of water. The entire font is made of a rich silicon bronze that compliments the modern architecture. Located in the City National Plaza in downtown Los Angeles, this contemporary water feature creates an urban oasis in the outdoor office courtyard. Made of stainless steel clad in absolute black granite, the perfectly reflective pool continually overflows and disappears into bed of river rocks. This minimal design compliments the adjacent natural foliage and rough stone wall and provides a tranquil reflection of the surrounding city landscape. Water Studio recently completed four free-falling waterfalls at the entry gate of The Vintage Club, a private golf club in Indian Wells, California. This design-build project consisted of redesign of an existing water feature along with full-size mockups, fabrication, and on-site services to install dramatic water falls that can be seen from distance. Water Studio worked with Oasis West Realty and Matt Construction to design and install the large, three-tiered bronze fountain for the hotel’s entry and smaller low-height fountain for the new Jean Georges restaurant. Both water features were designed using 3d modeling with extensive mockups and testing to provide flawless water effects that exceeded client’s expectations. We are proud to have been chosen for this project and we wish success to the best luxury hotel in Los Angeles! Water patterns are visibly present and circulate down our recently built multiple Water Veil that enhances the front entry facade of this stunning Beverly Hills, California residence. We recently built three reflecting pools with illuminated nozzles that adorn the courtyard entryway at the newly completed Mason residence in Playa Vista, CA. Water Studio finished the reconstruction and newly designed 25 ft. tall, four sided water veil which is located directly below a large skylight in the lobby of a commercial office building in Culver City, CA. A 17 ft. tall frameless Water Veil rises from a custom mosaic clad pool with multiple water nozzles. The half-round pool is capped in thick basalt stone. Underwater lights enhance the multiple water effects to create an architectural water feature that enhances this common outdoor space of a retail and office complex in downtown Los Angeles. Water Studio recently fabricated and installed multiple 3-ton granite water features in a contemporary courtyard in Playa Vista, California. Illuminated water from five bubbling nozzles flow over the monolithic granite block and disappear into a custom-cut brass grate covering the recessed basin. Water Studio worked with Office of the Designed Landscape to produce four strategically placed 14ft long linear, infinity-edge pools at Edmunds.com corporate headquarters. Water from the reflecting pools overflow into contemporary white basins creating the tranquil sound of water. The combination of light, sound, and water movement enhances their outdoor environment. Our second water feature at Playa Vista development is a triangular reflecting pond that is recessed into the ground with tiered illuminated steps. The pond is home to blooming water lilies, providing a bit of nature in an urban environment surrounded by concrete. We recently worked with Berliner Architects to install a new stainless steel podium water feature at Temple Beth Sholom in Santa Ana, California. This elegant centerpiece of the garden features series of illuminated jets in a dark reflecting pool that reflects the sky opposite the synagogue, adding light, texture, and movement. Water Studio recently completed multiple water and fire features at a golf resort in Indian Wells, CA. One of the main water feature consists of rivulets of water that fall around a floating patio overlooking the main lake. A 32 ft. wide textured granite water wall consisting of 2-inch thick custom fabricated granite slabs was recently installed at a courtyard in an office building in Beverly Hills, CA. Underwater LED lights illuminate the wall to accentuate the water textures and movement. A custom fire pit with automated controls was also installed in the courtyard to provide a welcoming and tranquil lounge area for the employees and visitors. Our latest stainless steel water wall was recently installed in a courtyard in San Mateo, California. Water runs down the 8 ft. tall satin-finish stainless steel surfaces on all sides and disappears into a brushed stainless steel basin covered with river rocks. This 11 ft. wide water wall was fabricated, delivered, and installed in one piece. We installed a custom water & fire feature at the Casa Mira View residential community in San Diego, CA; it is a stunning center-piece at the entrance of the luxury residential complex. Two curved stainless steel water veils are framed in copper cladding with a bronze patina finish. Standing at 25 ft. and 15 ft. tall, the veils interlock around a central flame column that is set ablaze at regular intervals. Water Studio recently designed, fabricated, and installed three new water features in the central courtyard at National Modern Living in Los Angeles, California. Each water feature consists of rectangular stainless steel fountain that seems to float above a succulent planter. Water shoots up from five nozzles and sheets down the polished stainless steel surfaces. A gentle sound of falling water can be heard as rivulets of water fall on to small beach pebbles covering the planter. The custom nozzles allow the concealed white LED light to illuminate the dancing water at night. The contemporary custom planters with powder coated stainless steel finish were also designed and fabricated by Water Studio. This curved water veil was installed in a new contemporary residence in Dana Point, California. Built as a geometric continuation of an existing curved wall at the entrance, the water feature stands at 7.5 ft. high and 10 ft. wide. Water flows down the stainless steel veil into a hidden recessed basin. This exterior water fountain in Glendale, CA is set in a courtyard of a public plaza. The concrete basin stands at 4ft. 3in. high and 29 ft. wide. Water bubbles from the three jet nozzles in the center of pool flow down a curved water wall with a granite weir edge. Three large underwater lights illuminate the stone-paved wall from a recessed basin to highlight the cascading water pattern. A sculptural water feature was installed at a private residence in Manhattan Beach, CA. Water falls down the 12 ft. tall copper water wall and falls into a 5 ft. tall reflecting pool covered in black granite and dark copper. Water continues to flow down the two smooth copper surfaces and falls into a recessed catch basin covered with river rocks. A polished stainless steel ring floats on top of the reflecting water to complete this tranquil water feature. We designed, fabricated, and installed a textured glass water wall at the new Montage Residence Offices in Beverly Hills, California. The sea-blue glass water wall stands approximately 7 ft tall by 5 ft wide with textured surface on one side to create cascading waves of water. Crushed blue glass pebbles cover the basin to compliment the blue hue of the water wall. Photos courtsey of ORES Beverly Hills office and Plush Home. Water Studio completed a beautiful water feature for a newly opened HEB grocery chain in Austin, TX. Seven custom-made glass panels form a 8 ft. arch over the entrance to Cafe Mueller. Water flows down the laminated colored glass into a concrete basin, flanked by three small bubbling fountains on either side. Photography by Jessica Mims. The center piece in the lobby of the new Embassy Suites in Chattanooga, TN is a Water Studio feature consisting of two interlocking curves that showcases multiple textures of water within a sculptural form. The curved Water Veil with bronze frame allows water to trickle down the translucent stainless steel screen from a height of 14 ft. On the shorter feature, water continuously overflows from the curved copper wall into a bed of polished black river rocks. The asymmetry of the sculptural forms with moving water engages the hotel guests from various locations within the lobby. The new Water Veils at Newport Bay Towers are two of the tallest ever built for outdoors. The taller Water Veil near the swimming pool is over 45 ft. tall. The 35 ft. tall veil in the central courtyard also features a mosaic tiled fountain pool with multiple water nozzles and a split basalt fountain in three sections. Powerful LED lights from DDP/Emerge were utilized to illuminate the Water Veils at night. We recently designed, fabricated, and installed a 20 ft. tall, illuminated water feature for Glendale Adventist Medical Center in Glendale, CA. The water feature consists of a 20 ft. tall curved Water Veil framed in brushed stainelss steel. Color changing LED lights were utilized to slowly change the color of water from inside the curved structure. A polished stainless steel reflecting pool surrounds the curved Water Veil and gently overflows to create a complimentary water effect. A 9 ft. wide by 14 ft. tall Water Veil stands in between the pool deck and the driveway of a contemporary home in Beverly Hills, California. Water continually runs down the translucent stainless steel screen and disappears into a narrow stainless steel basin covered with black river rocks. In the entry garden area, a 3 ft. wide by 20 ft. tall curved copper column with bronze patina rises next to the main staircase. Water falls down the textured concave surfaces and smooth outer surfaces, creating two complimentary water patterns that flow into a recessed stainless steel basin. The half-cylindrical copper tower is visible from the entry garden and from the interior of the multi-story home. A recessed copper water wall, approximately 14 ft. wide and 11 ft. tall, was recently installed at a contemporary home in Laguna Beach, California. The textured copper water wall and stepped catch basin were inset into an existing plaster wall and concrete steps. A remote pump system with programmable flow control valves was utilized to enhance the cascading water effects. Water Studio recently worked with CalAsia Construction to build the new mosaic-tiled water wall at the Rosa Mexicano restaurant in San Francisco. The multi-colored water wall is over 30 ft. wide and is the main focal point of the newly-opened restaurant. Cascading water runs down the iridescent glass tiles and behind 119 diver figures that are positioned in a diving motion. 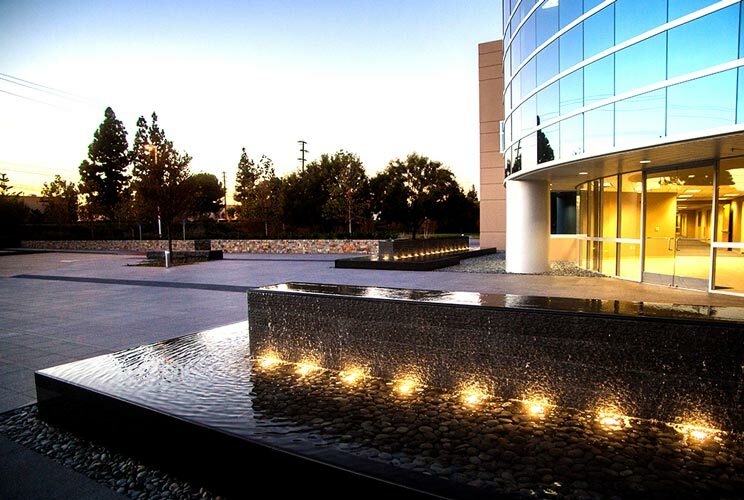 Two large water features were recently designed and built at the new Amada America’s manufacturing center in Brea, California. Each water feature is approximately 33 ft. long and 12 ft. wide and are positioned perpendicular to each other on each side of the main entry. From the top of each reflecting pool, water falls down textured basalt and falls into an overflowing granite pool that rises 1 ft. above the dry river rock bed. A large concrete reservoir tank was used along with equipment in a concrete vault to clean and circulate the water. Water Studio designed, fabricated, and installed an eleven ft. tall exterior glass and stone water feature at Tribeca West in West Los Angeles, California. This free-standing water feature consists of four, six ft. wide glass panels that overlap to create an eighteen ft. wide water wall that becomes the focal point of the newly remodeled office complex. The innovative structural design allows the frameless glass panels to be suspended with minimal structural frame. Extensive engineering and testing were conducted to build a structurally sound water feature that can withstand the strong wind loads and also meets local building codes. In front of the water wall (facing the lounge area) a low-height textured stone water feature continually overflows to create a reflecting pool with the soft sound of falling water. A new 24 ft. tall water feature at Unical Aviation in California consists of an 18 ft. tall column of fire burning inside two curved Water Veils with water falling down translucent stainless steel. The interlocking veils rise from a 22 ft. round reflecting pool that continuously overflows over textured basalt, creating a circular wall of white water. A cloud of fog surrounds the veils, emphasizing the primal elements of the feature. A series of white LED lights illuminate the water effects, and playful laminar jets interact with viewers walking near the lower pool. This monolithic granite water wall is located at the L.A. branch of the famous Milk Studios in New York City. Water Studio provided design, engineering, fabrication, and on-site adjustment services for the water wall, which serves as a tranquil backdrop to a spacious terrace. The size and simplicity of the feature are eye catching, complemented by the dancing reflection of moving water on the surface of the reflecting pool. An innovative glass water wall stands in front of a staircase in the entry lobby of the new design LAB headquarters in Gardena, California. The three glass panels are frameless and appear to float above the beach pebble covered basin. The floating glass allows water to drip in rivulets creating the pleasing sound of flowing water. A glass curtain wall system with brushed stainless steel “spider” brackets is used to support the glass panels. The water distribution header is concealed above the ceiling and the company logo is subtly etched on the backside of the center glass panel. The glass water wall was installed in mid-July, and fresh, new photos (seen below) were snapped by a professional photographer just last week. This summer, Water Studio is working hard to develop a strong and relevant presence on Facebook and Twitter. Please ‘Like’ our Facebook page today using the link below and if you ‘tweet,’ be sure to follow us on Twitter (@waterstudio) as well! These social media forums will be a fun online space for us to share recent projects and media mentions, publicize upcoming events, and share other content and industry news that may not be available on our website. We even plan to have contests and giveaways regularly to engage our fans and reward our most loyal supporters. Thank you for your support and we hope to connect with you online soon! This water sculpture is located in a residential backyard within an inviting outdoor dining space, yet visible through the kitchen window. The sculpture consists of two offset half-round stainless steel structures with a granite-lined upper pool. The sculpture is 3 ft. tall and approximately 2 ½ ft. wide. The varied textures of water are showcased in this work with the perfectly still pool at the top, cascading water down polished stainless steel, and falling rivulets at the bottom make the sculpture appear to float. Underwater lighting is used to illuminate the center gap and river rocks cover the bottom basin. Spanning the lobby’s entire main wall in a corporate headquarters, this black granite water wall’s aesthetic impact is comparable only to its incredible scale. At a width of 19 ft. and a height of 27 ft., the wall fills the viewer’s visual extents while climbing or descending the glass-treaded staircase. Underwater lights at the base and recessed lights in the ceiling enhance the gently cascading waves of water. A remote pump and filtration system with ultraviolet light water treatment is utilized to provide a perfectly functioning water feature that will become the focal point of the lobby. Measuring 22 ft. tall and 11 ft. wide, this two story water wall was designed to follow the arc of the main curved wall in the grand room of a contemporary home. Water cascades down the entire textured copper wall surface and falls into a bed of polished river rocks. A series of underwater lights illuminate the wall from below and accentuate the water patterns as they form and fall from above. The water wall is a prominent and dynamic feature of the home, serving as the backdrop for the grand stairway. A 22 feet tall spiral water feature was recently installed at the new Children’s Hospital in Omaha, Nebraska. The spiral form complements the surrounding space in a whimsical manner, mimicking other sculptural forms in the space. Water Studio worked with HDR and Kiewit Building Group to design and install this innovative water feature. The design and fabrication process involved extensive engineering and testing that included 3D modeling and complex metal forming. Some details include curved horizontal “ribbons” that reinforce and complement the spiral shape and pure white LED strip lighting to illuminate the twisting Water Veil. The granite pavers which surround the water feature were also sandblasted to match the graphical pattern in the terrazzo flooring. The hospital is still under construction and is expected to open its doors this fall. Located in the outdoor lounge area of a new Bel Air residence, designed by Landry Design Group, our latest fire and water feature consists of five curved copper structures in various heights and widths that surround a large flame located in the center of a shallow reflecting pool clad in granite. The outer surfaces of the curved structures are ridged to create cascading waves of water. Underwater lights and dancing fire on water illuminate the sculpture at night. The newly constructed Methodist Women’s Hospital in Omaha, Nebraska is now home to Water Studio’s tallest curved Water Veil. Designed in collaboration with HDR and installed by Meyers Carlisle Leapley and Davis Erection Company, this water feature shines as the new hospital’s focal point in the lobby. The unique arrangement of the water feature’s three elements creates a diverse form which appears to change with vantages throughout the lobby. Two free-standing, curved Water Veils, 12 ft. and 26 ft. tall, are clad in polished and brushed stainless steel to match other finishes in the space. Water flows over the surfaces of a 5 ft. natural basalt stone column which intersects the tall Water Veil. Underwater lights accentuate the cascading water textures on the Water Veils and the basalt column. Black granite pavers and a terrazzo surround conceal the stainless steel basin. The 11 ft. tall by 15 ft. wide curved water feature at Laguna Cliffs Marriott Resort & Spa immediately greets guests entering the main lobby. The water feature artfully pierces and provides the playful illusion of water falling from the ceiling. The custom white glass tile frames the Water Veil and wraps around the basin. This quiet and mesmerizing water feature has become one of the top attractions at the resort. The Fire/Water Feature, approximately 5 ft. by 8 ft. is located in the outdoor bar and restaurant patio with incredible views of the Pacific Ocean and Dana Point Harbor. A single row of flame emits from a narrow gap between two infinity edge reflecting pools made out of copper with bronze patina. The juxtaposition of fire and water in such close proximity provides an amazing display at night. One of the tallest Water Veils ever built, the stainless steel Water Veil at Studio 837 Condominium in Studio City, CA is over 35 ft. tall. The water feature can be seen from both sides and is located in the main atrium space. Two large copper water walls are nearly complete at the Promenade in Long Beach, CA. The water walls, designed in collaboration wtih Jon Cicchetti Landscape Architects, mimic the ocean topography of Long Beach Harbor. Water falls down all sides of the copper structure and disappears into a stainless steel basin covered with red granite pavers. A glass rain tower, approximately 1 1/2 ft. square by 8 ft. high stands within a pool in the entry courtyard of a private residence in Playa del Rey, California. A series of low-height square water sculptures float above the water in the surrounding pools. Water Studio designed and fabricated seven frameless Water Veils for the new spa lounge at The St. Regis Princeville Resort in Kauai. The frameless Water Veils consist of concealed stainless steel structural frames that allow water to fall down the translucent screens without any frames. The cascading water on the screens fall continuously and are visible from both sides. Underwater lights are used to accentuate the distinctive water textures. The spa was designed by WATG and built by Unlimited Construction Services of Hawaii. Recently completed for Topson Downs in Culver City, this water feature designed by our principal, Sean So, was approved by the Cultural Affairs Commission as fulfilling Culver City’s Art in Public Places Program requirements. The water feature is a wall mounted copper relief that floats above the reception area. Approximately 6’-6” tall and 9’-2” wide, the water wall is composed of five stepped vertical copper panels with irregular machined ridges. The machined ridges of each panel manipulate the flow of water, creating a variety of water textures within a single object. The recessed and protruding panels help to accentuate the changing water textures that are constant, but ever changing. Water continually flows from the top of the water wall and disappears into an intricate trough that follows the shapes and textures of the copper panels. All copper surfaces have a bronze patina to provide a warm background that will change over time. From a distance, the water wall appears to be static and smooth, and as the viewer approaches, subtle but very distinct and fluctuating textures are revealed. Underwater lights illuminate the flowing water and highlight its natural elegance. The public art project for the City of Whittier, CA is located on Washington Blvd. at the entry to Presbyterian Inter-community Hospital’s new medical office building. The project was commissioned by the hospital to fulfill their public art requirement and also to provide an inviting feature that can be seen from the street. The design was developed by our principal, Sean So and approved by the City of Whittier’s public arts committee. The water feature is made primarily of absolute black granite, with stepped, multiple tiers. Each tier provides a unique water effect. The first of two water features were installed at the new Huntington Outpatient Pavilion Breast Center in Pasadena, CA. A curved Water Veil with a granite infinity pool rises from a half-round base. Below are a few progress photos. Designed in collaboration with Skarphol Associates, the water feature for Aera Energy is a multiple-panel, recessed glass water wall with curved stainless steel trough, sandblasted gradation, and etched logo. The gradient fade of the glass provides privacy between the building lobby and the new wellness center.